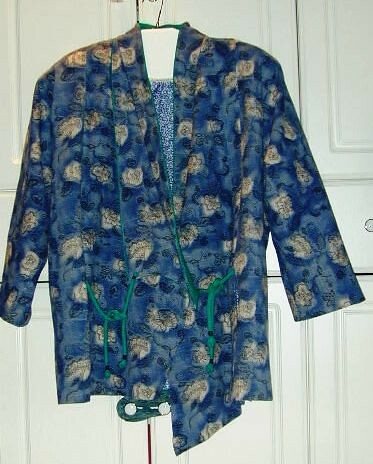 I made this coat back in 2002 and never posted it to my blog. I collected what I had written about it and posted that below. 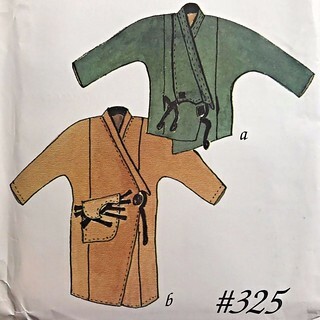 This pattern is pretty easy to sew. The sizing is generous. Usually, I leave out the shoulder pads. I have very broad shoulders. I used the biggest, thickest should pads that I could find. This could also be due to the fact that I used a fairly lightweight fabric, burlap, and did not underline the jacket with anything. I recommend this coat. It’s very functional and stylish. You can make it casual, like mine, make it dressy or businesslike with a nice wool and by leaving off the flaps, or make it fanciful with lots of embellishment. I loved the look of this pattern, Nomad Coat by Lois Ericson. It’s very functional and stylish. You can make it casual, like mine, make it dressy or businesslike with a nice wool and by leaving off the flaps, or make it fanciful with lots of embellishment. I’ve wanted to make a jacket or coat from a printed floral denim for a while, but I haven’t been able to find a denim that I like. The fabric for this jacket is burlap. The fibers and the weave are nothing like denim, but I think the overall look is denim-like. All of the fabrics came out of my stash. I had enough lining fabric, but I was short on the burlap. I decided to use the “contrast” fabric, a green poly crepe, for the back panel. 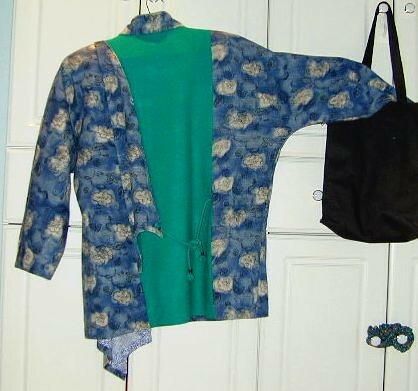 I used fusible tricot interfacing on the backs and fronts of the jacket to make it stiffer, more denim-like and medium weight fusible interfacing on the neckband. I cut the lining fabric too small at the bottom fronts, so that it pulled the jacket fronts under. Naturally, I had serge finished the edges before checking to see if there was enough lining so I didn’t have anything to let out. Thank goodness the jacket has an assymetric front. It was a simple matter to fold the lower edges under. I love the details on this pattern. The decorative flaps are fun, and the covered cording adds a nice touch. The cording is very easy to make by following the directions in The Great Put On by Lois Ericson. In the pattern, Ms. Ericson calls for using the cording instead of a buttonhole. I went one step further and used the cording to tie the jacket shut. I may add snaps or hooks at some point. The ties are not very secure and are rather floppy. Overall, I’m very pleased with this short coat.